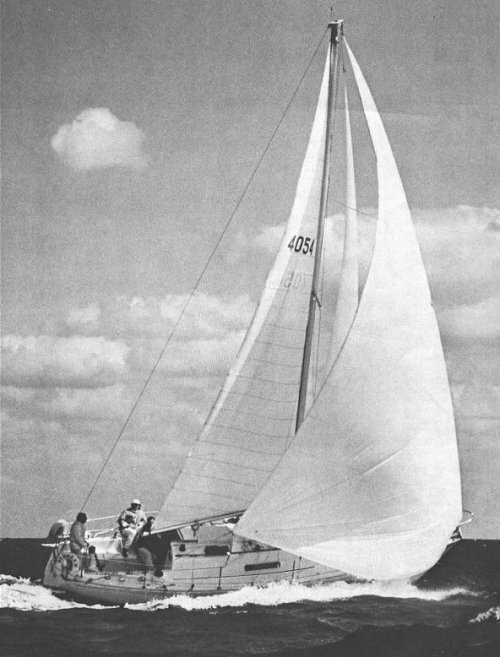 First called the REDWING 35 and built by Hinterhoeller Ltd. a development of the INVADER 35. It was renamed the C&C 35 when Hinterhoeller was merged with C&C Yachts. In 1973 a re-designed model was introduced, later designated the C&C 35-2. (or Mk II). In all, 351 C&C 35s were built. Production for the C&C 35-2 ended in 1975. The nearly one foot increase in length of the Mk II is a result of raising the sheer several inches. In addition, the scimitar-shaped rudder of the MkI was replaced with a more conventional, partially balanced spade. The after sections of the MkII were reshaped to reflect the then-current IOR design trends, sail area was increased by a little over 50 square feet and an additional 620 pounds of ballast were added. The deck and cabin house of the MkII were also modified eliminating the integral spray rail on the cabin top that was a prominent feature on the MkI. The cockpit was changed to a "T" configuration, and a bridge deck added for the mainsheet. The interior was spruced up to make it a little more yacht-like in appearance and, last but not least, all these changes resulted in a 30 % increase in displacement to 13,800 pounds, and draft increased from 5' 3" to 5' 6". Construction of the 35 is a solid glass hull with balsa cored deck. The interior is similar between the MKI and MKII models. The galley and navigation station are flip-flopped on the two models with the MKI having a starboard side galley aft and a port side quarter berth/navigation station combination. Both models have a fiberglass cabin sole and minimal bilge area. The Universal Atomic 4 gas engine was the standard auxiliary power for both models. Some of the later MkII models were offered with Westerbeke diesel engines. From 1983 to 1987 C&C built another 35 model, referred to here as the C&C 35 MKIII, which is an entirely different design.